The snapshot shows a little girl with her arm placed round her brother, their backs to the camera. They’re seated on the bow of a boat, their blond hair blowing in the wind, their arms and legs uncovered and tan. “This photo of my brother and me sums up my whole childhood,” says Alysa Herman, M.D. But it’s an image that is unlikely to be reenacted now because these days when Dr. Herman goes out in the sun, she’s never without a hat, protective clothing or sunscreen. Dr. Herman is a skin cancer surgeon, one of a handful so accomplished that she is trained to perform Mohs micrographic surgery, the main surgical procedure used to treat skin cancer. She operates her own private practice in Coral Gables. She is also affiliated with Fredric Brandt, M.D., the internationally known dermatologist, for whom she handles skin cancer cases. When she was 15, young Alysa went off to boarding school in Connecticut and then entered Franklin and Marshall College in Lancaster, Pennsylvania. After that, she earned her medical degree from the Boston University School of Medicine before coming to Miami as an intern at Jackson Memorial Hospital in Miami. In the meantime, she had become fascinated with dermatology, so she performed her residency in the field at Cornell-New York Presbyterian Hospital in New York City. “You know, they say that the eyes are the mirror of the soul but the skin can be the portal that shows what is happening in the rest of the body,” she says. Dermatology is a broad field and within it, Dr. Herman found herself fascinated by Mohs surgery, a type of microscopically controlled surgery used to treat common types of skin cancer. “I found it all so fascinating. This is a field that combines surgery, oncology and dermatology. With Mohs, you can trace the roots of the cancer and get a cure rate of over 99 percent. So it’s a definitive procedure, it’s curative and it’s a safe outpatient procedure,” said Dr. Herman. In fact, it was perfect for someone like her, who had loved the game “Operation” when she was a child. So, after finishing her dermatology training, Dr. Herman went on to become a Mohs Micrographic Surgery Fellow in Los Angeles. Afterward, she returned to Miami to join a dermatology practice and in 2011 set up her own private practice in Coral Gables. In addition to overseeing a busy practice, Dr. Herman is also the current president of the Miami Dermatology Society and on the faculty of the University of Miami Miller School of Medicine. When she was growing up, the notion that the sun could be dangerous was laughable, says Dr. Herman, who would return home from school to find “my mum sunning herself in her bikini, Barbra Streisand or Barry Manilow playing in the background, and she’d be brown as a coffee bean,” Dr. Herman recalls. Weekends were for boating, and “on Sunday nights, at my house, it would be Solarcaine Aloe gel,” she recalls. Nowadays, though, it’s a much different story. Dr. Herman goes to the Bahamas to see her family and friends as often as possible, but when she goes boating, she’s covered in protective clothing. “My friends laugh at me,” she says. But they also turn to her when they develop skin cancer. “I’ve operated on many of my childhood friends,” she noted. Dr. Herman is so passionate about her work that she spends most of her time consumed by it, both on and off duty. In 2005, she and a few of her colleagues formed the “Blade and Light Society,” a nonprofit organization that provides free care and teaches doctors in developing countries abroad. (The society is named for the scalpel and laser; the instruments the doctors use to do much of their healing.) Thus far, they have worked in Chile, Greece, Romania, Colombia, South Africa, and in June they will be volunteering in Bulgaria. “This is one of the most fulfilling things I do,” says Dr. Herman. “When I was in Chile, I saw patients who had to wait a year to see a doctor; so as a result, their tumors were of significant size and complexity. In Colombia, I met so many people who developed skin cancer working out in the coffee fields who were never educated about the need for sun protection,” added Dr. Herman. Dr. Herman spends a lot of time trying to educate her patients about skin cancer, which is rising at epidemic rates. “I’m in my early 40s and when I started my training I never saw someone my own age with skin cancer. Now I do surgery on 20- and 30-year-olds. I see so much skin cancer on young people that it’s alarming. I recently took off a skin cancer from the lower eyelid of a 21-year-old college student,” she said. Any change in skin color, whether it is red from a sunburn or brown from a tan, is the body’s signal that damage is occurring. 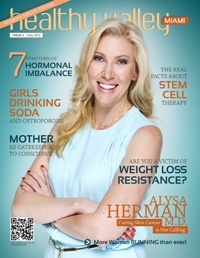 View the full article about Alysa Herman M.D. – Curing Skin Cancer is Her Calling.